Short services of Thanksgiving were held every Hour in Westminster Abbey on VE-Day 8th May 1945 from 9am to 10pm and attended by approximately 25,000 people. A Service was also held on the following Sunday, 13 May, when the Standards of Canada, Australia, New Zealand & South Africa were laid on the High Altar to symbolise the Loyalty of the whole Empire during the War. From April 11th 1946 Craig Planned, & Conducted many Formation Training Flights in the Lancasters Mk.I FE (Far East) with Tiger Force Livery in preparation for both VE-Day (8th June 46), the Goodwill Tour of the USA (Operation Lancaster) in July/August 46, & the Battle of Britain Commemoration Fly-Past on the 14th September 1946. From the 11th April, A J L Craig was rehearsing Formation Flying in preparation for the full Flypast on the 8th June 1945 in the Lancaster TW880 TL-F. The Flypast Plan involved Meteors, Spitfires & Hurricanes and each Flight was supposed to be at different heights to allow the Faster Planes to fly over or under the Lancasters. Unfortunately, the Weather was not co-operative with a very low Cloud Base which caused all the Planes to Fly at the same height so the faster Fighters went around the Outside. No.35 Squadron came down The Mall at 1500 feet at a Speed of 184 mph in a Formation of 307 Aircraft. The Weather which so often hampered Air Operations during the War interfered with the Flypast of the RAF & Fleet Air Arm Squadrons. When they were Briefed for the Flight the Crews were warned of bad Weather approaching from the West, but the Meteorological Department Forecast was that it would not reach London until the afternoon. Until the last minute the Forecast promised to be accurate, for up to the Rendezvous Point at Fairlop Aerodrome Nr Romford, the rain held off, the Cloud Base was no lower than 3000ft and visibility was reasonably good. In the short distance between the Eastern Suburbs of the Capital and the Centre there was a sudden change, and as the leading Aircraft approached the City the rain started in earnest, and almost unbroken curtain of Clouds started to descend, and before Admiralty Arch, the ‘Aiming Point’ was reached the visibility was restricted to about a ½-mile. The conditions imposed a severe strain on the Crews of the Aircraft Flying in Formation and it was only by the superb control of their machines that they managed to adhere to the strict timing Programme and to maintain the pre-arranged Order. In view of the adverse conditions, the close Formation Flying was admirable. The end of the Military Victory Parade was just turning into the Mall as the Single Hurricane flown by an anonymous Battle of Britain Pilot, crossed the Saluting Base. It was followed 3 Coastal Command Sunderland Flying-boats and a number of Transport Command Halifax’s. The Representatives of Bomber Command 12 Lancasters of No. 35 Squadron led by Wing Commander A J L Craig, DSO, DFC, DFC, the RAF’s youngest Wing Commander came next, flying in Triangular Formation. From his position in the Nose of the leading Lancaster, it was possible to catch only an occasional glimpse of any other Aircraft. Somewhere in the gloom to the Rear of the Bombers were Mosquitoes from the British Airforce of Occupation in Germany and of Fighter & Coastal Commands; Beaufighters of Coastal Command, Naval Air Arm Firebrands, Fireflies, Seafires, & Sea Mosquitoes; and various Types of Spitfires, Hornets & Tempests, representing BAFO & Fighter Command, whose Units of Meteor & Vampire Jet-propelled Fighters brought up the rear. Altogether about 650 Pilots & Aircrew Members took part in the Fly-past, and 4 Members of the WAAF travelled as Passengers in the Lancasters. They were Mary Stanley Smith (soon to become Mrs Craig) Personal Assistant to Air Marshal Sir Norman Bottomley, AOC in C Bomber Command; Sergeant Edna Coatea, Watchkeeper in the Operations Room at Graveley, Huntingdonshire where 35 Squadron is based; LACW Jean Forbes and Corporal Betty Jones, 2 Clerks of No.11 Group, who were being rewarded for Typing the whole of the Instructions relating to the Air Display. In the main, the Aircraft in the Fly-past were representative of the powerful Air Forces with which Britain ended the War. Only the solitary Hurricane was a Veteran of the Battle of Britain, though to the layman there was little difference between the Spitfires and the earlier Types which the German crews used to cry out in alarm ‘Achtung Spitfeuer‘ The Sunderland’s too were little changed from those that guarded our Convoys during the height of the U-Boat menace. One missed the familiar outlines of the Blenheims & Battles, which were the standard Light Bombers in the early days; one of the Defiant Fighters, with their backward firing Turrets which gave the Luftwaffe such a nasty surprise during the Dunkirk evacuation; and of the Wellingtons (The RAF’s beloved Wimpy’s, which carried the Battle into the heart of Germany until the 4-Engined Heavies were available. From the Ranks of the Naval Air Arm, a noticeable Absentee was the old trusty ‘string bag of Bismark fame’ – the Swordfish Bi-plane, which enjoyed the distinction of remaining in the Front Line from start to finish of the War. No doubt because of the great similarities of Aircraft participating in the Aerial Procession – they ranged from 150mph to 350mph. Jet Fighters – were a problem, but this was solved by so timing the convergence of the Units that when the Single Hurricane was over the Saluting Base the Meteors were 68-miles away over Foulness Point & the Vampires were just taking off from West Malling Aerodrome in Kent. Having flown in Tight Formation at 1500ft from Graveley to the 1st Turning Point at Wattisham Aerodrome, Suffolk and turned again at Bradwell Bay, on the North side of the Thames Estuary, the Lancasters saw their 1st Navigational Aid at Fairlop Aerodrome, the Rendezvous Point. where a Barrage Balloon wobbled in the breeze and the golden Sodium flares could be seen several miles away. As they flew across the much-battered East End, over Wanstead, Hackney, Bethnal Green, Shoreditch, Finsbury, & The Strand to the Admiralty Arch; Barrage Balloons spaced at intervals of a mile showed the way, and occasional Flares acted as further Guides. Though it was not yet raining the Streets in the Suburbs appeared strangely deserted. The City too was almost empty, but as we left St Paul’s behind on our left and flew over Fleet Street & The Strand, London came suddenly to life. As the Aircraft dodged in and out of wispy clouds one could see the people standing in little knots on the pavements, faces upturned. waving or pointing upwards. The Lancasters for this Force, known as the “Tiger Force” were fitted with American Radio Equipment and were tropicalised for Operations from Okinawa. With the dropping of the Atomic Bomb, the War ended before the deployment of the “Tiger Force” could go ahead. 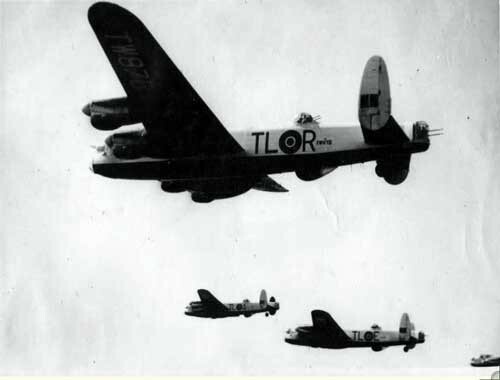 Some of the “Tiger Force” Lancasters were built to a modified B.I standard, which was renamed the B.VII. These Lancasters had the Martin 250CE Mid-Upper Turrets and had the FN20 Tail Turret replaced with an FN82, with 2 x .50 cal machine-guns. A long thin Intake fitted to the Starboard Fuselage, about halfway along (not sure of purpose) – Cooling of the Crew Space? After the end of the War in Europe, a Force of Lancaster’s was being built up in preparation for Operation Downfall, the Invasion of Japan. As the War wound down, the Canadian Squadrons of 6 Group were being re-equipped with Canadian-built Lancaster Bombers so that at the outset of Tiger Force Training, they would all have the same equipment. 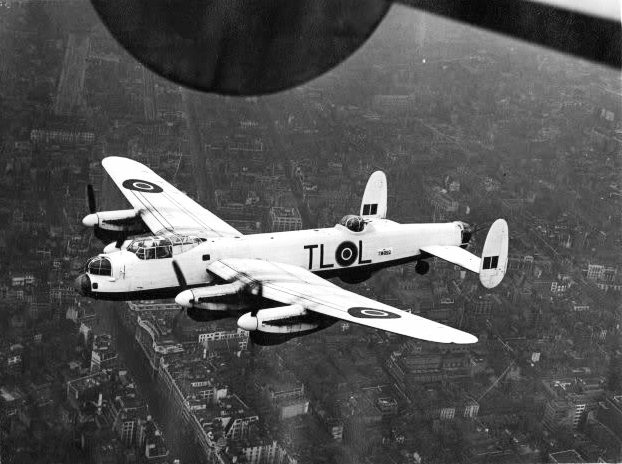 141 brand new or relatively low-time Lancaster Mk.1s were assigned to Tiger Force, though many of them still had not even been delivered to the RAF Following the End of the War in Europe, the Lancaster Mk.10s in Service with the RCAF were flown to Canada by their Crews, set to be modified, painted & crewed for Tiger Force Operations. Flying out of England over a period of several weeks, they journeyed to the Azores and from there to Airbases in Nova Scotia & Newfoundland and, finally, on to a big Repair Depot at RCAF Station Scoudouc in New Brunswick. Dozens of low-time Lancaster’s, fresh from Combat or at least European Operations, sit on the grass at Scoudouc’s Repair Depot & Equipment Park, where they were to be modified as Tiger Force Lancasters for the coming battle against Japan. Only one Aircraft was lost, ditching in the Ocean off the Azores, but no Airmen were lost. Without a Canadian requirement for a Heavy Bomber Force, the scores of Lancaster’s harboured in Scoudouc were going nowhere. It was soon realised that the Lancaster’s would not fare well stored in the humid & salty Ocean air of Scoudouc, and they were prepared for a Ferry Flight to drier air in Alberta. That Province had many recently closed Air Bases from the British Commonwealth Air Training Plan that were ready to be Fired up again to accept the Aircraft & Mechanics to keep them relatively healthy until a plan could be made for their disposal or further use. Eventually all the 140 or so Lancaster’s were delivered to Alberta, but on one single day in September of 1945, the skies above the tiny Hamlet of Pearce, Alberta, and its nearby Training Base absolutely thundered with the arrival of 83 Lancaster’s over the one afternoon. The Aerodrome is still visible today; however, all of the Structures from the old Station have been removed. A Memorial Cairn has been installed at the site of the original Guardhouse to inform Visitors of the Station’s History. Pilots & Aircrew, realising that they would likely never fly a Lancaster again, ripped the Blue Prairie Skies apart, turning, banking, zooming, flying low level, & scaring farm animals until they had no fuel left. After the Lancaster’s were brought to RCAF Pearce, Crews on the Ground were tasked to keep them flyable, starting their 4 Merlin engines daily & looking after leaks & dried seals. To relieve space at Pearce, many Lancasters were dispatched to other outlying Airfields like Fort McLeod, Penhold, & Calgary. For some, this would be the end, eventually struck off charge, stripped of their valuable Engines – some sold for Scrap, some sold to Farmers for the contents of their Fuel & Glycol Tanks or Handyman projects, or even just to have one. You could buy a Lancaster with all 4 Merlins for just $250 to $350. The lucky ones, more than 70 in all, were selected for new roles as Anti-Submarine Patrol Aircraft, Ice Reconnaissance or Photographic Mapping. In these new Roles, they Flourished, becoming part of the rich History of the RCAF. Within 10 years most of these Lancasters were obsolete as well, and they also ended up back in Alberta for further storage & eventual Scrapping. TW869was replaced by 115 Squadron’s PA436 due to undercarriage retraction problems at the start of the US Goodwill Tour. Various shots of Aircraft flying in Formation during Victory Parade rehearsals. Most are Air to Air shots of the Planes in Flight at distance – often seen as dots. The Planes in the item are probably Lancasters, Meteors & Vampires. 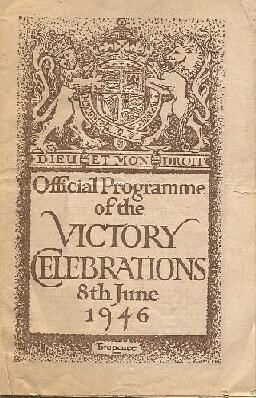 The London Victory Celebrations of 1946 were British Commonwealth, Empire & Allied Victory celebrations held after the defeat of Nazi Germany & Japan in WW2. The celebrations took place in London on 8 June 1946 and consisted mainly of a Military Parade through the City and a night-time Fireworks Display. Most British Allies took part in the Parade, including Belgium, Brazil, China, Czechoslovakia, France, Greece, Holland, Luxembourg & the United States. The Parade arrangements caused a controversy surrounding the lack of Representation of Polish Forces. This was followed by a Fly-past of 300 Aircraft, led by Douglas Bader. Various shots of Formation of RAF Planes – including Flying Boats & Twin-Engined Fighters Flying over London on VE-Day 8th June 1946 – MD. The film is quite badly scratched. Over London. TL-R – F/O Robinson, TW-E – F/O Hampson, TW-D – Fl/Lt Clarine, TW-A – S/L Beetham. TL-L – F/O Frank J Cheshire over London. A young WAAF Mary Stanley Smith said casually to a friend – ‘I would love to be on that VE Day Flight but Alan Laird Craig doesn’t like WAAF Officers’. Some 24 Hrs later this remark was relayed to Alan who telephoned her and said – I understand you would like to come on the Flypast – to which she replied – Oh yes Please! and he said – Be at Graveley at 5.30am on the 8th June. She went from Bomber Command HQ to Graveley and arrived there at 05.30hrs prompt. The Squadron flew over London and after 20mins returned to Graveley flying low over St Neots to give the Locals a Treat. They then had a very late lunch at the local Pub ‘The Three Horshoes‘ 23, High Street, Graveley, St Neots about a mile from the Base at 3.30pm. 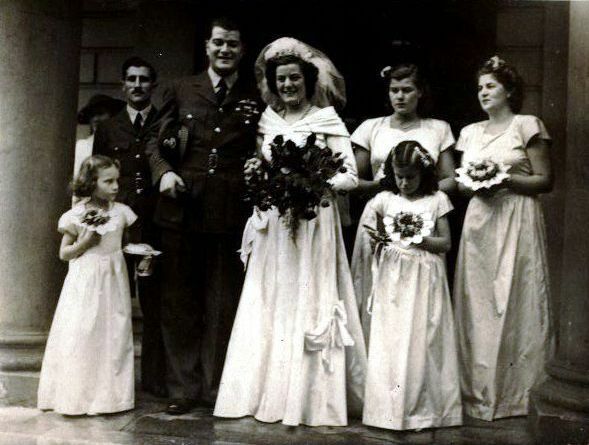 While at the Pub someone said to her – Mary what are you going to do when you leave the WAAF – Before she could answer Alan said – I’ve been posted – she’s going to Marry Me! Mary said – Norfolk or Suffolk? – No – Buenos Aries as Assistant Air Attache – So…., Will you Marry Me? said Alan – Certainly! – said Mary. The Battle of Britain Flypast on 15th September 1946 (Battle of Britain Sunday) with some 330 Aircraft was the last Ceremonial Flight commitment before 35 Squadron was returned to normal Bomber Command Duties and transferred to RAF Stradishall. These former Airborne Hero’s were soon to be absorbed in the midst of the Scrapheap of Society as Dinosaurs of a former era like their Mighty Aircraft.